Had Cory Burke not been bodied into submission by Leandro Gonzalez Pires and marked into obscurity by Miles Robinson or had Fafa Picault finished all the great chances he helped create, today we would be talking about Brenden Aaronson being MLS Player of the Week. Aaronson will have to settle for just being Philadelphia Player of the Week. 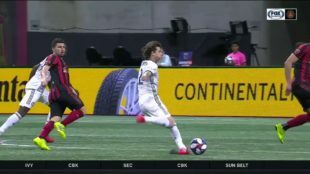 The 18-year-old from Medford played brilliantly in his MLS debut, controlling the ball tidily in tight spaces, unlocking Atlanta’s defense with seeing-eye death balls, and capping his night by scoring the Union’s lone goal. Never mind that his goal was a deflected shot that wrong-footed Atlanta goalkeeper Brad Guzan. Aaronson took his chance well, and the goal wasn’t the most impressive part of his day anyway. Aaronson had already showed he belonged on the field by flourishing in the absolute pressure cooker that is Mercedes Benz Stadium, arguably the most intimidating soccer venue in the league. Whatever nerviness Aaronson may have felt was never apparent on the field. At times, he looked like the best player out there. The biggest knock against his performance was that he needed more touches. Imagine how good statistically Aaronson might have been had the Union started anyone currently playing at the level required of a starting MLS striker, who could have made something of the chances Aaronson was creating. Burke has been consistently poor to start the season, his frustration apparent in his body language and the number of times he goes down with an “injury” that really isn’t one. The increasing amount of MLS game film on Burke may mean that MLS teams have figured him out. Meanwhile, Picault has been excellent as an inverted left winger, much as he was last year, but unfortunately, the Union’s new sporting director expects him to be a striker. New finishing boots must arrive for that. There will be discussion all week about whether Aaronson should start this Saturday against Columbus. Absolutely. Positively. Without question. Aaronson must start. Union fans should be quite happy Saturday to see Marco Fabian coming off the bench at the 65-minute mark after a good shift from Aaronson. This was not Anthony Fontana breaking through for an opportunistic goal in an otherwise ordinary shift. Aaronson even played well defensively, recording two tackles and providing smart and active defensive cover, although he may want to stop appealing to referees for fouls. Teenagers don’t get that in the big time. For a fan base with fewer shattered hopes, we might be revving up the hype train and making stronger Wally Pipp references, but this is Philadelphia, so let’s maintain perspective. We are not here to anoint a future star. One good game does not make a starlet. But that kind of performance earns you the next start. The kid can play. Alejandro Bedoya’s headlock/tackle of Aaronson on the goal celebration was surprisingly hilarious and poignant. Way to go, captain, but don’t kill the kid. I think – and have thought – that Aaronson will be the best of the “prospects” that have been added to the squad lately. Trusty, McKenzie, Jones, Fontana, Mbazio, etc. He was sooo impressive with Steel. And he’s still so young. His best attributes were dribbling, passing, and dangerous runs into the box. The runs into and around the box that he made with Steel were particularly impressive. I think we saw all of that against ATL. With Steel, he was often higher up the field than the striker. I saw that a few times against ATL as well. With Fabian back, maybe they could try Aaronson as a False 9. Or move Fabian to striker and keep Aaronson at CAM. I just don’t want the kid to not play again for a few months. Who here among us actually believes Curtin will start The Kid over Fabian? Marco Fabian is a world class player with experience at the highest level of play. There is no reason he cannot play any position on the field. Play him along side Fafa, have Aaronson feed him the ball, and let him finish the goals no one else on this squad seems to know how to do. It’s Tanner’s system, not Curtin’s. I say let’s just go with the old fashioned system of play that puts your best players on the field, somewhere. Period. (a la a Tyler Adams move to right back). Most times, it’s talent that wins, not systems. If that doesn’t happen this week, I’m not sure how much control Curtin actually has. No Coach in the world would not start Aaronson at the 10 after that performance. Well, maybe Mourinho. +1. Fabian must start. Aaronson must start. Bedoya must start. After that I don’t care. But I want those 3 on the field as much as possible. I don’t care where they line up just get your best players on the field. I decided to buy tickets for this weekend’s match because Curtin basically HAS to start Aaronson again. Jones is away, Creavalle is away, and though Monteiro is here, I can’t imagine him getting the start in his first match after what the kid did on Sunday. Why not a midfield of Fabian, Aaronson, Bedoya, and Monteiro? Aaronson and Fabián could be side by side in a 4-2-2-2, in the fashion of Bethlehem recently. No idea whether the first team has practiced that. As of March 15, MLS website does not yet list Monteiro on the Union’s roster. This isn’t a choice. I would start both Fabian and Aaronson. I don’t think we need Medunjanin in the starting XI at all. Aaronson must also have to start for business reasons. Perhaps if Curtin’s stubbornness doesn’t allow Aaronson a starting slot, Tanner will overrule him. Curtin can’t start a kid who plays like that and bench him if you want him to have any value for a sale to Germany in the near future. Now is the time.